Wave Field Synthesis (WFS) is a spatial audio rendering technique that places virtual sound sources in real space. With a custom-built, 372-channel array, Bobby can place sound sources accurately in physical space in front of the speakers -- in short, he makes sound holograms or "holophones." 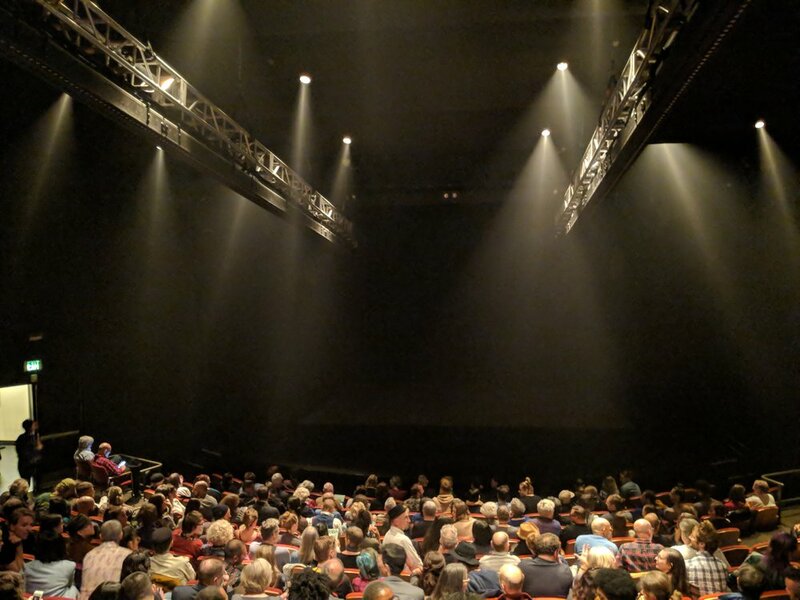 In 2017 Bobby became the first sound designer to use overhead WFS in a theater context, for Andrew Schneider’s AFTER, which premiered at EMPAC. During the show, sounds move throughout the audience, accurately localizing in front of the array, for specific seats. The audience hears sound moving in impossible ways, whispering in their ears, and moving through them. 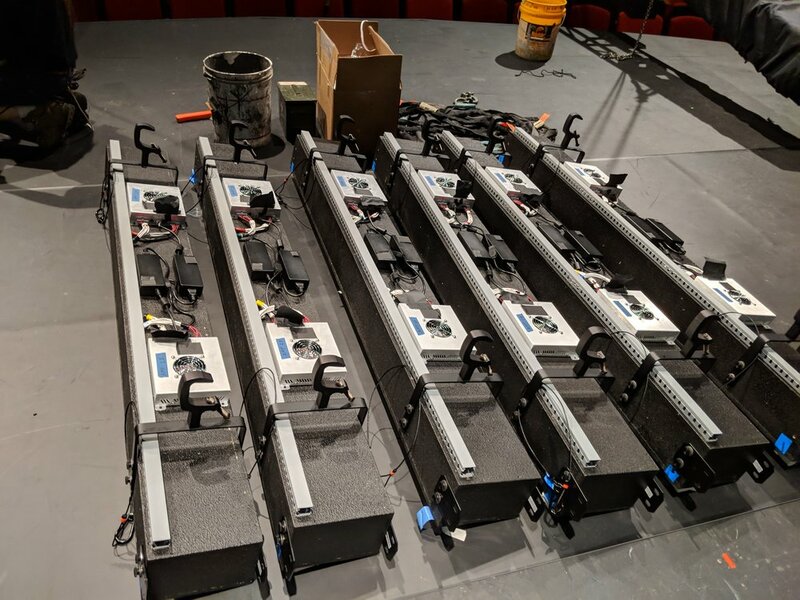 In order to continue developing and touring the show, Bobby (along with Andrew Schneider) hand fabricated an exact duplicate of the WFS array designed at EMPAC, with funding from Simons Foundation. 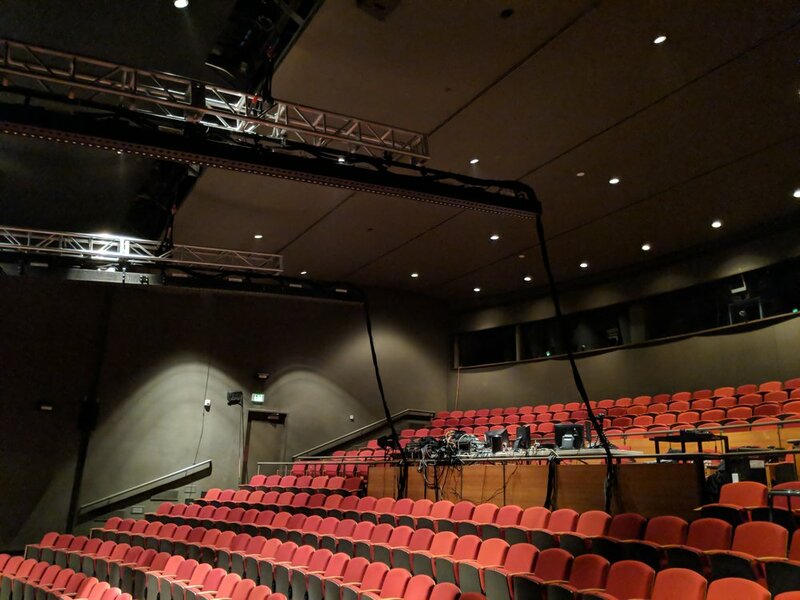 The new array has 372 individually addressable channels and uses IRCAM's Spat 5 suite within Max 8. The WFS filters have been created using Spat 5’s “spat5.wfs.config” object. The synthesis is precise and physically correct. You cannot distinguish the synthesized source from a “real” wave field at frequencies below the upper frequency limit of the system. The system allows for undistorted wave field generation up to the spatial aliasing frequency of 3.3 kHz, and experimental configurations for testing the perceptual effects of frequencies between 700 Hz and around 6 kHz. Below is a time-lapse of (part of) the build. That is one of 12 boxes. 31 speakers in each 6-foot modular box. Bobby is currently building WFS filters and Max patches for every possible configuration of boxes for many types of spaces and contexts. The WFS arrays are modular and tour-able. They pack up in custom road cases and go on tour. Currently they are often with Andrew Schneider’s theater show AFTER. Some photos below.